With the first reviews of the LEGO Movie sequel - The Second Part - now landing online and suggesting a strong follow-up to the original almost universally, the behemoth toy company have revealed full details of their tie-in sets for the movie. The sets will be available from February 1st from the LEGO online store (and other retail partners), and offer an early insight into some of the set-pieces in the movie. The spoilers are thankfully pretty limited, but there's a range of sets catering to the whole spectrum of fans from the 3000+ piece Welcome To Apocalypseburg mega-set (aimed at builders aged 16 and up) to the DUPLO set introducing younger fans to the invaders who appeared at the end of the first movie. 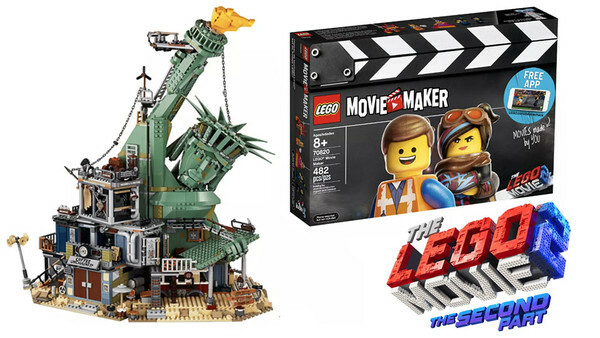 The most interesting set (other than the huge premium one) is definitely the Movie Maker, which allows builders to make their own LEGO Movie scenes. It comes with movie stage, camera stand for your smartphone device (which there's a linked app for) and props. It's something different for LEGO fans, certainly. Are you excited for the LEGO Movie 2 and these tie-in sets? Share your reactions below in the comments thread.